York University Professor Emerita Haideh Moghissi was invited to share her expertise on the topic of gender equality during a one-day conference held in Stockholm earlier this year. 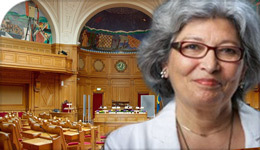 Invited by Sweden’s Social Democrats parliamentary group and the National Association Against Honor Related Violence (GAPF), Moghissi was a plenary speaker during the GAPF International Conference on Jan. 22, which took place at the second chamber of the Swedish parliament. The event explored the theme “Gender Equality vs. Gender Apartheid” and included presentations from and debates among: leaders of the parties of the Swedish parliament; ambassadors of France, Norway, Austria and Belgium; journalists; members of government agencies; and the social commissioner of Stockholm. Moghissi, an internationally acclaimed analyst of women’s issues in the Muslim world, is recognized as a leading scholar of gender and Islam, Muslim diasporas and race relations. She is a professor emerita of sociology and equity studies at York University, and also served as associate dean of External and International Relations for the Faculty of Liberal Arts and Professional Studies. In recognition of her influential body of work, Moghissi was awarded a Trudeau Foundation Fellowship in 2011. She is the recipient of several major awards for her work, including the Status of Women Award of Distinction from the Ontario Confederation of Faculty Associations (OCUFA) in 2015. While in Stockholm, Moghissi also presented a lecture at the Department of Ethnic Studies, University of Stockholm, on the rise of West and Islamic right-wing populism and its impacts on women’s quest for equality. This subject was also the theme of her lecture at Lehigh University in Pennsylvania in November 2017. The visit also included leading a faculty seminar discussion on her earlier book Populism and Feminism in Iran (McMillan 1994). Renewed academic interest in populism that is sweeping the U.S. and Europe also took Moghissi to Germany in June and July 2017, where she was a keynote speaker on the right wing and Islamist populism at the international conference Populism and Citizenship at the University of Potsdam. Prior to that, she delivered a series of lectures on complexities of change and cultural diversity as a visiting professor at the University of Augsburg.